With an increase in the prevalence of risk factors for chronic kidney disease (CKD) such as hypertension, diabetes mellitus, and obesity, there is an increase in the incidence and prevalence of CKD. In India, it is estimated that every year approximately 175,000 patients are diagnosed with end-stage renal disease (ESRD) requiring renal replacement therapy (RRT). Out of these, only 10% get RRT and only about 2.4% of patients receive a renal transplant. Resources for RRT are very scarce in India and majority of them are available only in urban areas. Renal transplantation is one of the best modalities of RRT because of its cost-effectiveness, longer patient survival, and better quality of life; however, it is available only in a few centers. Prime hurdles for the renal transplantation are lack of transplant facility, a high cost of transplant in private facility, and shortage of donors. With an improvement in public education, awareness and with the help of public-private partnership through various nongovernmental organizations, deceased-donor renal transplantation (DDRT) program is increasing in popularity. In spite of the increasing trend, DDRT rate in India is only 0.34/million populations,, one of the lowest rates in the world. In Sawai Man Singh hospital Jaipur, first DDRT was done successfully in February 2015. Till now (December 2017), 25 DDRTs have been done in our center. Here, we share the experience of DDRT in our center. We analyzed the outcome of 25 DDRT recipients retrospectively, transplanted between February 2015 and December 2017. Patients received induction immunosuppressive therapy with methylprednisolone (MP) (500 mg intravenously × 3 days) with either intravenous rabbit anti-thymocyte globulin (r-ATG) (1.5 mg/kg/day × 3 days) in the high immunologic risk group (history of previous transplant, history of blood transfusion in the last 3 months, and more than two pregnancies) or basiliximab (20 mg on day 0 and 4) in low-risk patients ( first transplant). Basiliximab was used instead of r-ATG in two patients with the history of the previous transplant for fear of sepsis because both of them had borderline high total count without fever. Maintenance immunosuppression consisted of prednisolone (20 mg/day, tapered to 5–10 mg/day at 1–3 months' posttransplant and continued thereafter), calcineurin inhibitors (CNI) (tacrolimus, [0.1 mg/kg/day]), and mycophenolate sodium (1440 mg/day). The doses of mycophenolate sodium and tacrolimus were adjusted according to complete blood counts and trough level of tacrolimus (on day 4, after 2 weeks, and every 3 months posttransplant). Infrequent monitoring of drug level was due to financial constraints. Tacrolimus dosing was adjusted to achieve target T0 concentrations. All patients received prophylaxis against cytomegalovirus and Pneumocystis jirovecii pneumonia infection. All patients were monitored postoperatively for the development of any immediate medical and/or surgical complications. Foley's catheter was removed on day 5 if no complications. A perinephric drain was removed on day 7. The recipient was discharged once stable graft function was established without any complications, generally on day 7–10. The double-j stent was removed on the postoperative day 21. All recipients were followed up and investigated in the outpatient department on a regular basis as per the standard guidelines till death or graft loss, whichever is earlier. Posttransplant renal allograft function was measured using serum creatinine. Delayed graft function (DGF) was defined as the requirement of dialysis within 1 week. Slow graft function was defined as serum creatinine >3 mg% after 1 week without the need for dialysis. On clinical suspicion of rejection, renal allograft biopsy was performed and rejection was diagnosed based on modified Banff classification. Protocol biopsies were not done. Rejection episodes were treated with standard antirejection therapies. Cellular rejections were treated with intravenous (IV) MP 500 mg × 3 doses ± ATG. Antibody-mediated rejections (ABMRs) were treated with MP 500 mg × 3 doses ± plasmapheresis (40 ml/kg per se ssion × 3–5 sessions) + IV immunoglobulin 100 mg/kg/day × 3–5 ± rituximab 375 mg/m2 body surface area single dose. The patient's survival was defined as the time from transplantation to death. Death-censored graft survival was defined as the time from transplant to the requirement for hemodialysis excluding graft loss due to death. Continuous variables are presented as mean ± standard deviation and compared using the Student t-test. Categorical variables are presented as proportions and compared using Fisher's exact test. P < 0.05 was used for statistical significance. The Kaplan–Meier statistic was used for survival analysis. Statistical analysis was done using Epi info™ (Version 7.2.2.2) developed by Centers for Disease Control and Prevention, Atlanta, USA and Microsoft Excel. During the study period (January 2015–December 2017), 155 renal transplants were done in our center, out of which 25 (16.1%) were DDRTs from donation after brain death (DBD) donors. Out of 18 DBD donors, 77.8% (14/18) were male and 22.2% were female donors. The most common donor blood group was B (55.6%), followed by A (22.2%). O and AB donors constituted 11.1% each. All had road traffic accident as their cause of brain death. 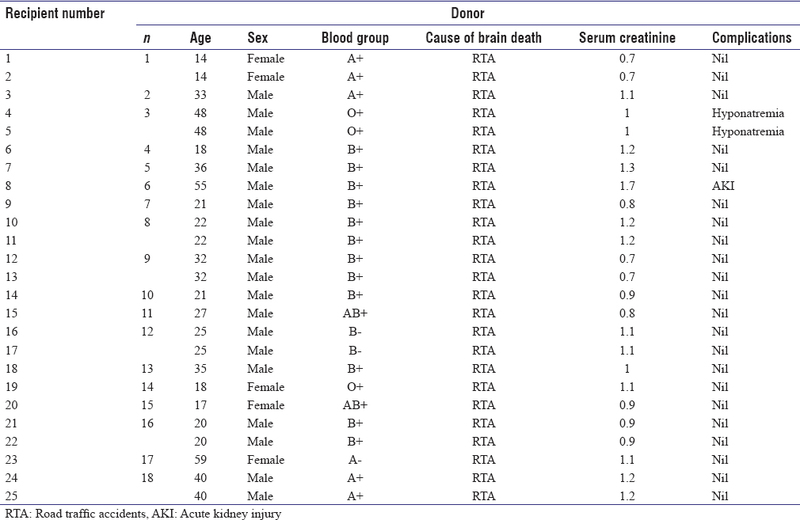 Donor characteristics are summarized in [Table 1]. The mean donor age was 30 ± 13.4 years, and the mean cold ischemia time was 114.4 ± 53.4 min. Male constituted 76% (19/25) of DDRT recipients. 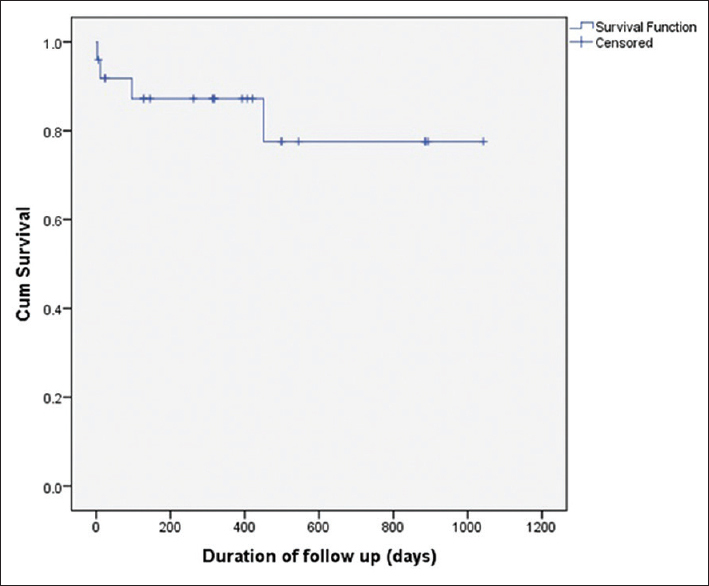 Posttransplant follow-up duration ranged from 1042 days to 24 days (mean 383.4 ± 322 days). The mean age was 41.7 ± 9.5 years. Various causes of ESRD included chronic glomerulonephritis 72% (18/25), chronic tubulointerstitial nephritis 16% (4/25), and polycystic kidney disease 12% (3/25). About 16% (4/25) had the second renal transplant with a history of failed previous live renal transplant. Patient characteristics are summarized in [Table 2]. 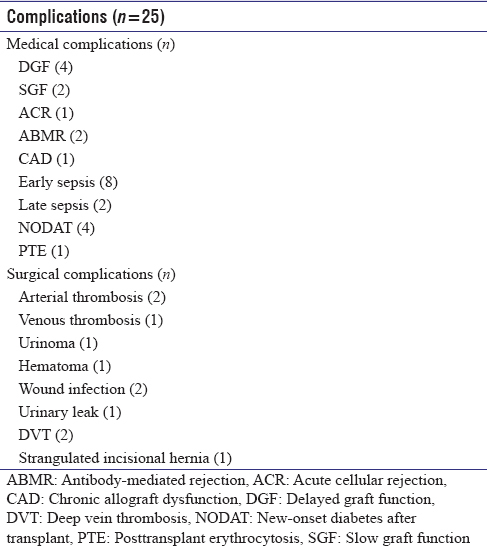 Medical and surgical complications are summarized in [Table 3]. 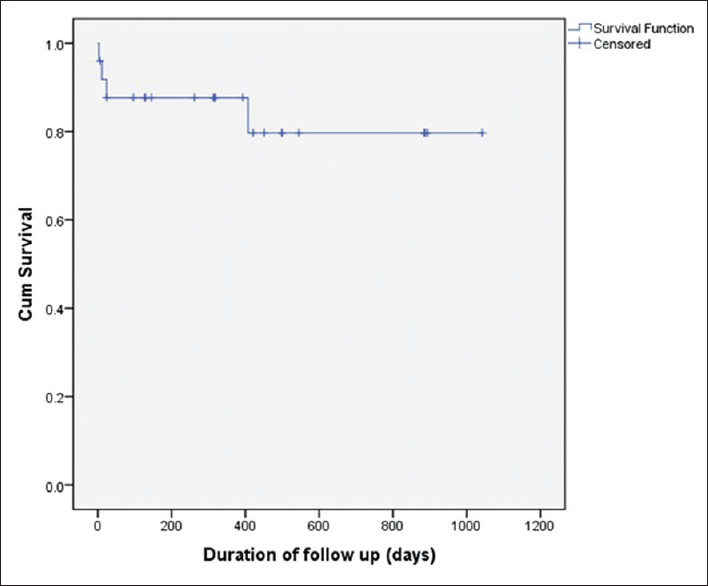 The patient's survival was 84% (21/25) [Figure 1], and graft survival on the last follow-up was 76% (19/25). Death-censored graft survival was 84% (21/25) [Figure 2]. A total of four recipients died, two recipients died due to early sepsis (<3 months) (one of them had graft loss due to arterial thrombosis) and two recipients died due to late sepsis (>3 months) (one pneumonitis and one systemic fungal infection). Two grafts were lost due to death with functioning graft. DGF was seen in 16% (4/25) of recipients. Causes of DGF in our study included transplant renal artery thrombosis (2), ABMR (1), and sepsis (1). Among those who had DGF, graft loss was seen in 75% (3/4) as compared to only 4.7% (1/21) among those who did not have DGF (P = 0.0067), suggesting that DGF is the important determinant of graft survival. Donor age and cold ischemia time were significantly high in those with DGF. Comparison of various variables in those with DGF and those without DGF are shown in [Table 4]. Biopsy-proven acute rejection was seen in 12% (3/35) of recipients with 2 (8%) having acute ABMR and 1 (4%) having acute cellular rejection. New-onset diabetes after transplant (NODAT) was seen in 16% (4/25) of recipients. The mean posttransplant creatinine in recipients with functioning graft on the last follow-up was 1.14 ± 0.2 mg/dl. In India, very few centers have a viable DDRT program. The current DDRT rate in India is only 0.34/million populations. In our center, DDRT program was started in February 2015 with accepting only heart beating (DBD) donors. In our center, 25 DDRTs (16.1% of total transplants) were done within the first 3 years of initiation of DDRT program. In this study, male constituted 76% of recipients showing the same gender disparity as with live renal transplantation. The most common medical complication in our study was sepsis. Early sepsis (<3 months) was seen in 32% (8/25) and late sepsis (>3 months) was seen in 8% (2/25) of recipients. An increased rate of sepsis could be explained by inadequate time for the evaluation of recipients for occult sepsis, possible transmission of infection from deceased donor kidney, and routine use of induction agents. The incidence of DGF was 16% in our center which was very less as compared to other studies in India.,,,,,, The reduced incidence of DGF in our study might be explained by young donor age (30 ± 13.4 years) and short cold ischemia time (114.4 ± 53.4 min). DGF is one of the most important determinants of graft survival. Well-known risk factors for the development of DGF are increasing donor age, donor type (living < deceased < standard criteria donor < extended criteria donor < donation after cardiac death), long cold ischemia time, and prekidney procurement care. In various studies, the role of DGF on long-term graft survival is inconclusive. 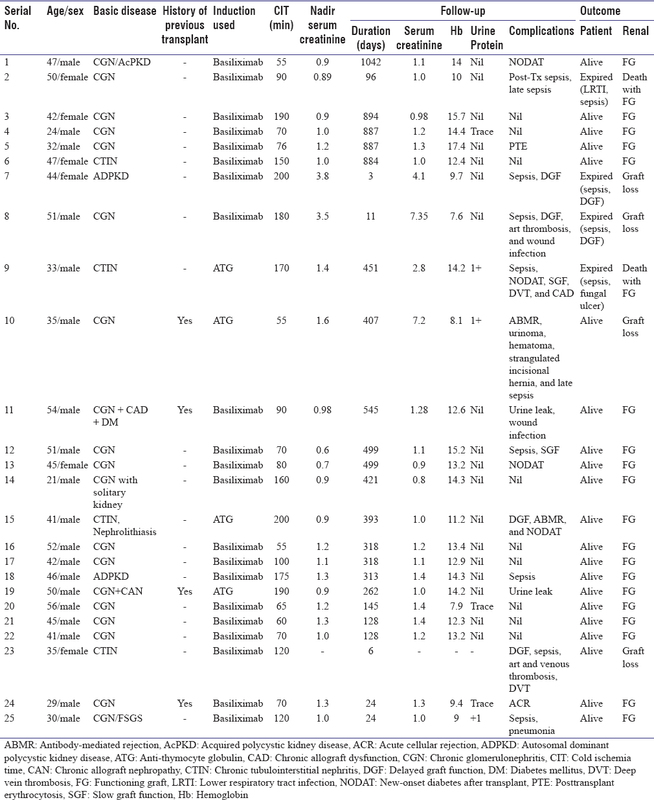 In a study by Gopalakrishnan et al., graft loss was significantly higher in those who developed DGF which was also observed in our study [Table 3]. The prevalence of NODAT varies between 2% and 53%. Major risk factors for the development of NODAT are deceased donor renal transplant (human leukocyte antigen mismatch), use of tacrolimus over cyclosporine, obesity, family history of diabetes, history of impaired glucose tolerance, and use of high-dose steroids. The rate of NODAT (16%) in our study was comparable with other studies. In spite of the small sample size and short duration of follow-up in our study, the future outcome and outlook of DDRT seem promising. The short-term outcome of DDRT in our center is comparable to other centers in India. DGF was the most important determinant of graft survival. With increasing public education, awareness, and with the help of public-private partnership, DDRT is increasing in popularity. The authors would like to acknowledge the immense contribution and support of the Department of Urology, Department of Anesthesia and Transplant coordinator at Sawai Man Singh Medical College and Hospital, Jaipur. Trivedi H, Vanikar A, Patel H, Kanodia K, Kute V, Nigam L, et al. High prevalence of chronic kidney disease in a semi-urban population of Western India. Clin Kidney J 2016;9:438-43. Kumar A, Mandhani A, Verma BS, Srivastava A, Gupta A, Sharma RK, et al. Expanding the living related donor pool in renal transplantation: Use of marginal donors. J Urol 2000;163:33-6. Indian Transplant Newsletter. Vol. 14. Available from: http://www.itnnews.co.in/indian-transplant-newsletter/issue43/Deceased-Donation-Statistics-380.htm. [Last cited 2017 Mar 09]. Abraham G, Vijayan M, Gopalakrishnan N, Shroff S, Amalorpavanathan J, Yuvaraj A, et al. State of deceased donor transplantation in India: A model for developing countries around the world. World J Transplant 2016;6:331-5. Mani MK. Review article, development of cadaver renal transplantation in India. Nephrology 2002;7:177-82. Prabahar MR, Soundararajan P. Cadaveric renal transplantation: The Chennai experience. Transplant Proc 2008;40:1104-7. Shroff S, Navin S, Abraham G, Rajan PS, Suresh S, Rao S, et al. Cadaver organ donation and transplantation – An Indian perspective. Transplant Proc 2003;35:15-7. Feroz A, Dabhi M, Gumber M, Gupta S, Shah PR, Rizvi SJ, et al. Cadaveric renal transplantation: Our experience at the institute of kidney diseases & research centre, institute of transplantation sciences, Ahmedabad. Transplant Proc 2007;39:721-2. Gumber MR, Kute VB, Goplani KR, Shah PR, Patel HV, Vanikar AV, et al. Deceased donor organ transplantation: A single center experience. Indian J Nephrol 2011;21:182-5. Kute VB, Vanikar AV, Shah PR, Gumber MR, Patel HV, Modi PR, et al. Outcome of live and deceased donor renal transplantation in patients aged ≥55 years: A single-center experience. Indian J Nephrol 2014;24:9-14. Schröppel B, Legendre C. Delayed kidney graft function: From mechanism to translation. Kidney Int 2014;86:251-8. Tanriover B, Jaikaransingh V, MacConmara MP, Parekh JR, Levea SL, Ariyamuthu VK, et al. Acute rejection rates and graft outcomes according to induction regimen among recipients of kidneys from deceased donors treated with tacrolimus and mycophenolate. Clin J Am Soc Nephrol 2016;11:1650-61. Wang JH, Skeans MA, Israni AK. Current status of kidney transplant outcomes: Dying to survive. Adv Chronic Kidney Dis 2016;23:281-6. Balla A, Chobanian M. New-onset diabetes after transplantation: A review of recent literature. Curr Opin Organ Transplant 2009;14:375-9.